When it comes to cosmetic and personal care packaging design, these savvy millennials already have already caught the eye—and the acclaim—of the beauty industry. And they plan to continue their speedy path by seeking out the hot trends of the future. 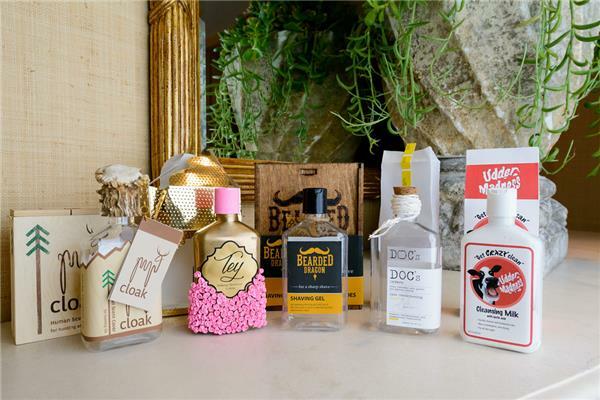 The Independent Cosmetic Manufacturers and Distributors (ICMAD) Association recognized these packaging up-and-comers in the 2016 Young Designers Awards Competition during a dinner ceremony last month at the Island Hotel Newport Beach, California. 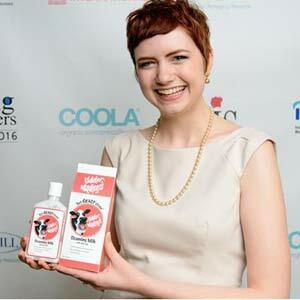 Chris Birchby, founder and CEO of COOLA Suncare, was the keynote speaker. Here in an exclusive interview with GCI, the top three winners talk about what inspired their notable creations, what types of packaging are most appealing to millennials and more. Shepherd: I wanted to create a fun product that would appeal to all ages and a design that would stand out against other products like it. I chose a cleansing milk because it is a more naturalistic product than other cleansers and its organic ingredients inspired me for the milk carton package design. I wanted the packaging to allude that the product was made from natural ingredients such as lactic acid, and I also believed that customers would be drawn to it because they would wonder why a "milk" product was in the cosmetic aisle. Shepherd: I think that sleek, minimalist designs are most appealing to millennials. Personally, that is what I am drawn to. Simplicity has a very contemporary and innovative feel about it and I believe younger generations seek out those qualities in products. As for trends, I believe that millennials prefer products with more organic and natural ingredients that are not tested on animals. Harris: As an avid outdoors[person], a great deal of my free time is spent in outdoor sporting stores such as Cabela’s Hunting and Fishing Store and Bass Pro Shop. The poor quality of package design for hunting products in these stores is very evident. Poor packaging, even on a high quality product, can make it dismissible. This dissatisfaction turned it into inspiration for my package design for the ICMAD Young Designers Competition. Human cover scent, a common product used by hunters, was my product of choice. As a hunter, the goal is to bring in a good kill and ultimately show it off. Part of this bragging in hunting elk is the size and score of the antlers. With this in mind, the focus of the package design became a genuine antler bottle cap. Wood was used on the outside packaging to fit with the environment of hunting. The name "Cloak" was derived from the idea that human cover scent is used to cloak the distinct odor humans emit which can easily spook an elk if they catch a drift of it. 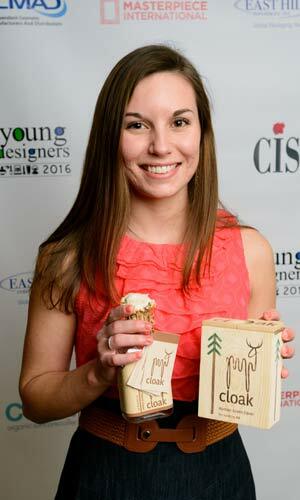 The product "Cloak" was created with unique wooden packaging and an antler as a bottle cap in order to stand out from comparable products. Harris: Millennials have unlimited access to package design examples through the Internet, including archives of package design throughout the past century. With this much exposure, it is easy to dismiss average package design. Good package design must demand attention. It must be unique; this can be accomplished multiple ways. Original package shapes are a huge trend in the past decade. Next to a cubic package, a triangular package will create greater interest. Interactive packaging is also very powerful. 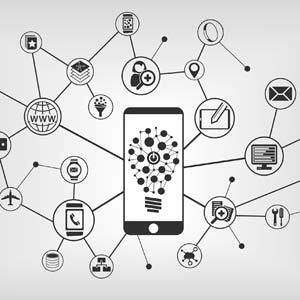 If the customer can interact with the packaging, whether it is how it opens, the images it creates, or the changes in color or form when they handle it, the product will be engraved in their mind and they would likely use it for a second time. Above all, good package design is always based around a solid concept. Without a foundation concept, the design seems unorganized and unintentional. There must be an overall cohesion in every aspect of packaging a product whether it is color schemes, materials, or humor. The high level of exposure to dull package design received by Millennials calls for innovative and witty solutions to packaging in personal care products. Finley: "Beaded Dragon" had a few angles from which the design got its inspiration. 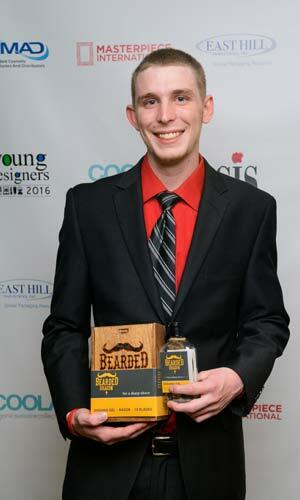 The design first started with the idea of a product for men [with] a design to support that demographic—that is when my idea of a shaving gel product began. Woodworking is medium I have worked with before and that inspired me to choose the style I wanted to design. Then, the process of choosing a name started. I [found] something that had an old, wood feel and at the same time makes buyers think about shaving when they hear the name. A few roommates and I own a bearded dragon, and when I was looking at his desert environment cage, it made me think of my product. [When] looking at the lizard’s cage, and how the name fits so well with the product, it gave me a huge deal of my inspiration for this product. Finley: The millennial generation, to me, seems like they want to be different but at the same time follow the trends going on. With so many different types and brands' personal care packaging, I believe that color and style plays a huge role in appealing to the millennial generation ... [and] will make a package that is easy to find [and] recognizable. On a huge shelf full of hundreds of personal care items, millennials [will] need that product that will catch their eye first, and not break their bank when looking at the price. Design: "Tey Makeup Remover Lotion"
Betancourt: My design was inspired by my mom, and my childhood: the roses and the technique that I used my mom taught me how to do it when I was a child. The colors are a combination of what I think today's women like. I decided to combine gold, because it is a color that for most people represents elegance, and the pink to represent a girly look. Also because it is a make-up lotion remover, I decided that it should look cute and pretty so it would be something that everyone will like to have—next to makeup. 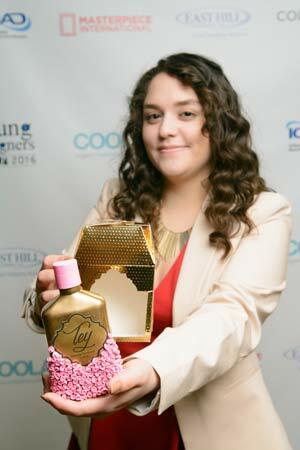 Betancourt: For millennials, packaging with a unique design is what most people like to buy. We are a generation where everything is based on how it looks. We post everything on social media, and so if a package is great and something new, we will show it to the rest of our friends. What we like the most is something really original, something that we can't find everywhere, something special. ICMAD's Young Designers 2016 winners and honorable mentions, which included Sarah El Mouden from Miami International University of Art & Design with her design, "DOCs Orders," were selected among more than 135 student participants from 14 schools competing in the annual program that fosters excellence in graphic and packaging design among colleges and universities nationwide. Photos courtesy of ICMAD/Jessica Sterling - photographer. For more information, visit www.icmad.org.